The award-winning bimonthly magazine providing in-depth coverage of education issues. Read this issue online as well as the archived editions. Abigail Cohen and Chelsea Goodly are senior associates in policy and advocacy at Data Quality Campaign, a national voice on education data policy and use. Persistent achievement gaps from early literacy to graduation rates can be addressed if we use data, one of the most powerful tools to overcome inequities and ensure that all children receive a high-quality education. How can we create an education system that meets the needs of every child? This question lies at the heart of efforts to advance education equity and challenges us to reimagine and rethink how we create classrooms, schools and systems where students’ needs are truly at the center. While opportunities for progress are boundless, as local leaders like you come together to engage around this critical question, one thing is certain – data must be a part of the answer. • Do students receiving English learner services exit the program at consistent rates across the district? • Are low-income students more or less likely to be taught by an effective teacher? • What proportion of students who are homeless have access to high quality pre-K? With the right data in hand, policymakers, educators, community members and parents are empowered to answer these types of questions, identify sources of inequity and determine the policies and practices needed to address gaps in achievement separating groups of students. • THE DATA YOU COLLECT AND SHARE REFLECTS YOUR VALUES. HOW AND WHAT YOU SHARE TELLS A STORY ABOUT WHAT MATTERS TO YOU AS A LEADER. 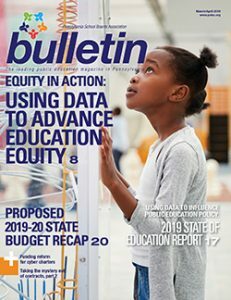 Ensure that the data you share paints a full picture of the outcomes and experiences of every student and clearly supports your state’s or district’s equity goals. Making available clear and comprehensive information that is aligned to your equity goals helps teachers and leaders better understand the value of this information and helps them invest in your vision for what’s possible. • DATA ALONE DOES NOT DRIVE ACTION. JUST RELEASING DATA IS NOT ENOUGH. WHILE IT IS AN IMMENSELY POWERFUL TOOL, DATA BY ITSELF DOES NOTHING. Real change is driven by empowering those closest to students like school leaders, educators, parents and community members to access, use and act on this data in new ways to support student learning. Exploring ways to build this capacity must be a prime focus to ensure that those directly responsible for student outcomes have not only meaningful access to the data they need, but also the time and training to use it to support students from the classroom to the dining room table. • MEANINGFUL DATA USE REQUIRES MEANINGFUL DATA. PEOPLE WILL NOT USE DATA UNLESS THEY VALUE AND TRUST IT. When you create a data tool or resource, think critically about who your audience is and ensure the design and content is accessible, understandable and empowers them to make strategic decisions. Prioritizing the knowledge and know-how of your audience helps foster a culture where this information is valued, understood and ultimately used to drive improvement for schools and students. So what does it look like when a district uses data to address specific equity issues? Leaders in Pittsburgh Public Schools (PPS) recognized that students across their district were not being equitably served. To address this concern, PPS focused on increasing students’ learning time through intentional partnerships with community-based organizations. This strategy allows the district to offer a greater variety of programming while expanding learning time after school and in the summer, when many students don’t have access to high-quality learning opportunities (which can exacerbate achievement gaps). 1. SHARE MEANINGFUL DATA: PPS securely shares relevant data with program partners on a quarterly basis so that they can tailor their programming to meet students’ individual needs. Each partner signs a data-sharing agreement detailing what data will be shared and any related student privacy protections. 2. HELP PROGRAMS USE THE DATA: PPS doesn’t just share the data, but also helps programs build their capacity to use it. Quarterly convenings bring partners and district staff together to collaboratively review data and make resource allocation decisions. 3. ENSURE DATA MEETS USERS’ NEEDS: Data is securely shared in two formats: a raw data set and an out-of-school time report card that organizes the data for each student individually (and only for students the program is serving that quarter). This gives programs flexibility in how they view and use the data depending on their needs and skill level. that provide year-round programming to students across the district. • Determine the equity questions that matter most to your community and ensure that you include a diversity of voices and perspectives when making those decisions. • Take stock of the data you need to answer those questions and consider how the data you already collect can support your goals. Check out these links for more on using data to benefit students. 1. District actions to make data work for students: Learn what steps local leaders can take to ensure that data in their district is used in service of student learning. 2. What is student data? Explore many types of data that support student learning, beyond annual state test scores. 3. Ms. Bullen’s and Mr. Maya’s data-rich year: Follow a teacher and principal through the school year to see how data help teachers, parents and others make sure students are meeting their education goals. 4. ESSA equity dashboards: These state profiles analyze state plans under the Every Student Succeeds Act (ESSA) on their commitment to equity and excellence. For more on equity in education, see www.psba.org/issue/equity/. Click here to read this issue online as well as the archived editions.